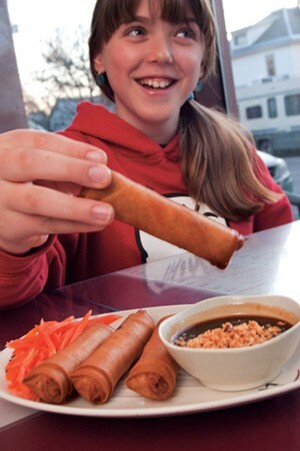 Restaurant Review: Pho Dang Vietnamese Café | Out to Eat | Kids VT - small people, big ideas! A good family restaurant doesn't have to stock crayons or special kiddie cups. I had this revelation at Pho Dang, a no-frills, hole-in-the-wall Vietnamese eatery in Winooski. Despite the charmless interior and the absence of a kids menu — or anything that specifically catered to the younger set — we had a thoroughly enjoyable, completely kid-friendly meal that was budget-friendly, to boot. When we walked in for dinner on a recent weekday night, one industrious young woman tended to the restaurant's seven small tables while managing a steady stream of takeout orders over the phone. She gave my husband, 11-year-old twins and me about five minutes to study the single-sheet, photocopied menu visible beneath the Plexiglass tabletop. The menu is straightforward. You can get pho — it rhymes with "duh" — which is a traditional Vietnamese rice-noodle soup made with mild beef, chicken or vegetable broth. Or you can select a noodle or rice entrée with a choice of protein: chicken, pork, beef, shrimp or tofu. Our appetizers hit the table within minutes of ordering — egg rolls for the kids and traditional Vietnamese spring rolls for the adults. The former were stuffed with ground pork and rice noodles and came straight from the fryer with no trace of veggies — just the way my kids like them. The latter were beautifully hand-rolled packages of pink shrimp, grated carrots, fresh herbs, thin-sliced pork and rice noodles, all wrapped in chewy, translucent rice paper. The blend of textures was interesting, but we were glad to have savory plum dipping sauce to boost the flavor. We'd barely eaten two bites when the entrées arrived. What Pho Dang lacks in atmosphere, it makes up for in speed. As far as I'm concerned, that's better for families with youngsters than any restaurant coloring menu. The three steaming bowls of pho — two chicken, one rare beef — were huge and exuded a rich aroma. They came with long, thin rice noodles and a plate of add-ons — basil, bean sprouts, lime wedges and chiles — to spice up the rather bland broths. I remedied mine with lime and hot chiles, while my kids chose a healthy application of soy sauce. They gleefully slurped their noodles, happy to leave rigid table manners at home. My husband ordered Bun Thit Nuong, grilled pork served on rice vermicelli. He, too, received a generous portion that was full of incredibly well-seasoned and still-sizzling pieces of stir-fried pork. The noodles were a great counterpart, soaking up the flavors but retaining their al dente texture. My husband emptied his bowl long before the kids and I were done with ours. When we hit our limit, I paid our very modest bill at the register. The whole experience took 30 minutes from start to finish and cost less than $50 for our party of four. Utterly stuffed, we went home with time and money to spare. What busy parent could ask for more?